I've been a bit reckless with my Indian Summer fabrics, just hacking away with no real plan. And hating everything that came out. I soon realized that if i want to actually have enough fabric left to make myself a quilt i would need a plan. A good plan. Cause the last plan didn't work so well. Remember the flying geese that ran out of the background fabric? And i'm pretty positive i didn't even blog about the giant swoon block that was going to be part of this quilt... It would seem that math wasn't my strong suit in school. It was all kinds of wrong. So after seeing some particularly fantastic medallion quilts floating around, i decided that's what i was going to make. But what to start with? I didn't feel that any type of star was going to cut it for the middle. That being said, it wasn't until after i actually made my middle that i thought a type of sunburst block would have been perfect, drat. Oh well. Enter Red Pepper Rita and her perfect quilts! If we could all just click here for a second! Dang! She totally hijacked my idea, right out of my head! And made it first... and with a lot more precision, i might add. So i thought i would just use my own Kaleidoscope pattern in a slightly bigger size, easy enough. I even had a stack of 6 inch origami paper that i could use for the patterns, perfect! No need to waste printer ink on a pattern that i could make myself, and i wouldn't have to spend all that time cutting out the pattern pieces! So after drawing one i came to the conclusion that it's not a waste of printer ink at all and really how much time does it really take to cut out pieces? As you can see from my drawing above there was no way that my points were going to line up the same for every 6 inch block. So i picked up Rita's free Kaleidoscope pattern from her Craftsy opened it in photoshop and arranged it so i could print two blocks on a single sheet, why waste paper right! So after deciding on a start with nine kaleidoscope blocks, i went ahead and did this! I love it! Though i still wish i had more of the Stella Dots in sterling. The Washi Waves are a little more cream then i would like but i think it still works! I love my little corner stones? blocks? whatever they're called. 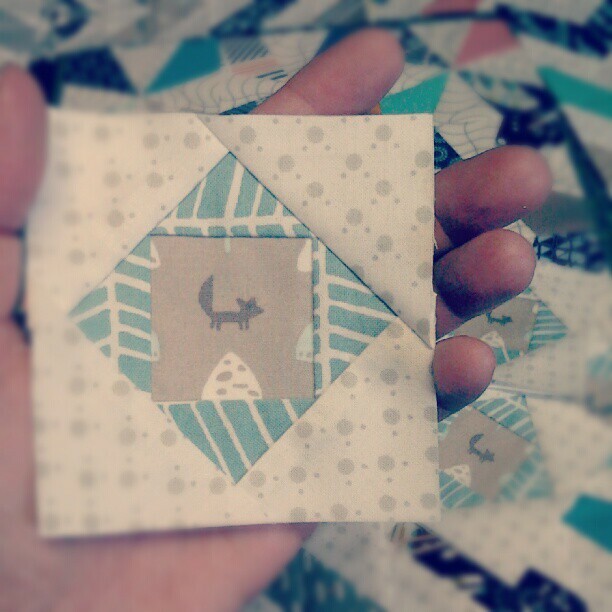 I fussy cut four tiny foxes for the center of each economy block... The center squares are just under an inch and a half finished and the whole economy block is 3.5 inches unfinished. I love this type of block, and see a lot more of them in my future. 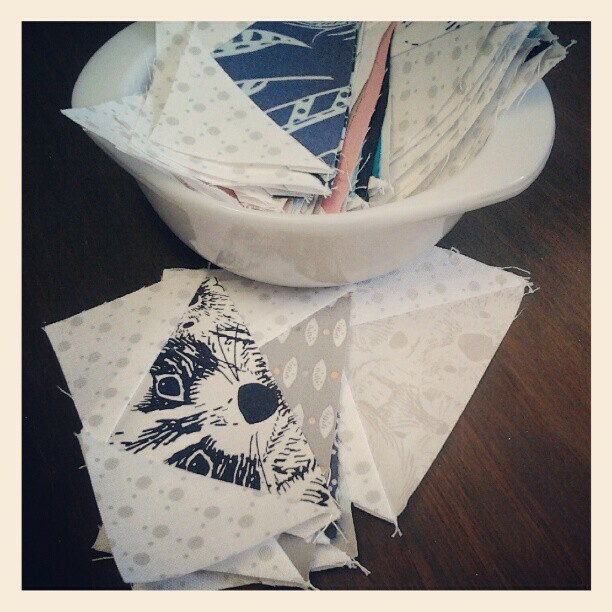 And if you hadn't noticed lately, i can't stop paper piecing! I love it, when it's not frustrating me to no end that is. Sorry for the wonky pic, see what i mean about having wonk when i don't need it! I considered another band of the washi waves but i would like to darken it up a bit. This print has a bit of a basket weave kind of look from afar that i think works nicely. Only not as wide as what i have here, maybe an inch finished? The washi border is 1 3/4 inched finished. Thoughts? The next border is going to be a doozy. (toss off spell check, doozy is in fact a word!) 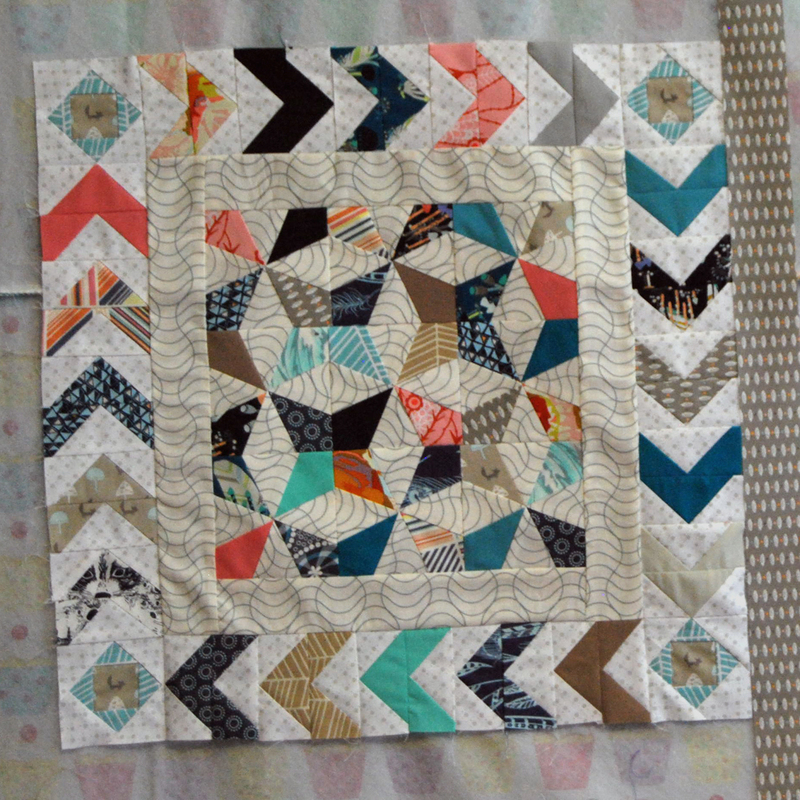 I'm doing a full border of Anna Maria Horner's feather blocks. Have you seen the size of them! About 18 inches! Here's a piece of the pattern next to my center. Um... how awesome is this going to be! Now the feathers themselves aren't quite as big. That's a bit of the background, but it is the final size. And you can also see that i have Sew What Sherlock's arrow up there. I believe it will be making it's way around the feathers. After of course another skinny plain border. What i'm wondering is what to use for the feathers as background fabric. I desperately wish i had more of the sodding dots! But i'm also wondering what they would look like with just a plain Kona PFD? Let the feathers really stand out. I think i'll make one up. After that... not really sure. So far with my finished center and chevrons it's twenty one and a quarter, add two inches for both sides of the next border, thirty six for both sides of the feather border, probably another three? maybe for the following borders and four for the arrows... come on math don't fail me now! High fives for finishing the start of my Indian Summer quilt! 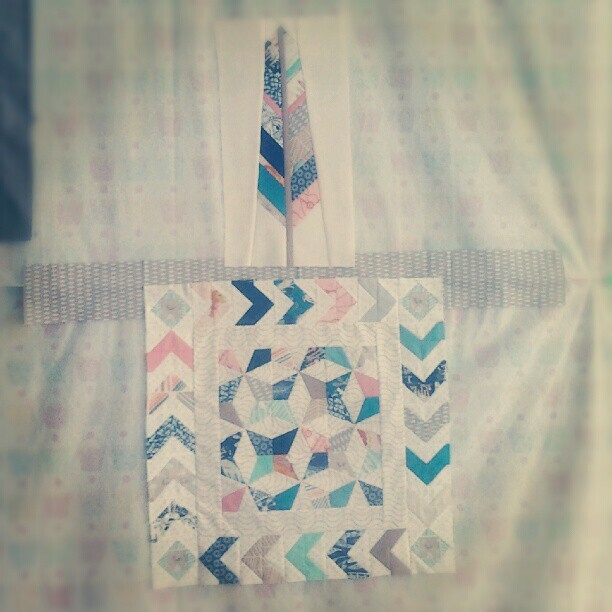 Linking up with Kristy's Paper Piecing Party, i foresee a lot of my posts linking up here! As well as Finish it Friday, which one of these days i will link up before the list reaches triple digits!! Sorry for the instagram pic... but what do you think? It's way too big isn't it? I'm wondering if i should have a bigger border in between the two. Maybe something an inch or so larger than the chevrons? Bulk up the center some more before adding in the feathers, which will ultimately mean more feathers, but they're awesome so i'm cool with that!! But what border next? Awesome quilt! It is going to be so fun watching it grow! Can't wait for follow-up posts. Love it! Good for you for getting your ducks in a row! I love where this is going and, having stalled my own medallion quilting plans for the past month or so, this might be just what I need to get my act together! im in love with your plan...this is going to be amazing. Wow, that is absolutely gorgeous, I LOVE it...the colour combination is great too!! oh my! love, love, LOVE this!!! I really like that you're getting really creative and mixing different blocks and patterns. It will be a one of a kind! Beautiful!! I'm not sure about the feather. I bet if you think it is too big, it is! It looks beautiful! It is going to look amazing! ooooo, gorgeous!! Love what you have going on here!!! i think there is a white with gray dot in the Willow Riley Blake line. Have you seen it and compared to the dot you have? Looking good! So here's a crazy idea on the feathers. What if... you still kept them for that border but you laid them against the centre square so you'd just have one feather per side and could put some plain background fabric to fill in the gaps? Might not be what you're aiming for, but a thought anyways! The arrow, the feather, the colors... DYING, this so so great. This is going to be amazing! I can't wait to see it all done. Love your fabric choices as well. Love the kalidescopes! I have printed these out, but haven't started. Are they super easy or should i proceed with caution? Yours is coming along great. The colors look perfect, and the foxy's are adorable.